I am trying to set up a new job for a Windows 10 VM running on a Hyper V Core. But it simply doesn't want to connect during the "Test now" sequence. I can access from another server to shared folders on the Windows 10 VM. Although I have a feeling that something needs to be changed on Windows 10 to allow the access ? is that user an administrator? As an alternative, did you try to enable and use testcomputer\administrator? I am not that experienced with windows, what do you mean exactly by "enabling" administrator in windows? I ask the other way round: what's the purpose of testing the credentials? Thank you for the answer! It worked (partly) after the activation. The purpose is that I would like to backup a SQL Server running in a VM later. And I am testing Veeam right now. RPC is good, it should be used always in "normal" environments. Yes, for SQL logshipping & restore it is important. 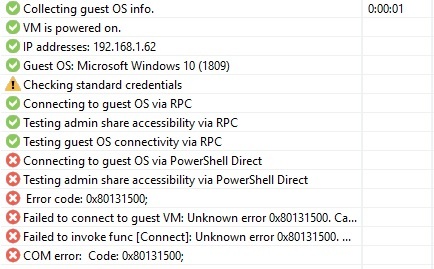 As you mentioned you are not too deep into Windows, I suggest to leave the PowerShell direct part as it is. It's just a fallback that should never be used anyway in "normal" environments. Thank you for the answer, I meant that I mostly work with Linux systems. 1. Whats wrong with the main account in contrast to the Administrator Account? 2. I was reading that RPC is "enough" but Veeam doesn't produce a Backup then, it stops with an Error and says that powershell doesn't work. @2: that's strange. RPC is the first way per default and only if it fails, then it tries powershell. To answer the question why the job fails, I can only suggest to open a case. Please post the case number here.